provide a core curriculum that can build microsystems’ capability, provide excellent care, promote a positive work environment, and contribute to the larger organization. Eugene C. Nelson, D.Sc., M.P.H., is director of quality administration for the Dartmouth-Hitchcock Medical Center and professor of community and family medicine at Dartmouth Medical School. Paul B. Batalden, M.D. is the director of health care improvement leadership development, Center for the Evaluative Clinical Sciences, and professor of pediatrics and of community and family medicine at Dartmouth Medical School. Marjorie M. Godfrey, M.S., R.N., is instructor for community and family medicine at and director of the Clinical Microsystem Resource Group at Dartmouth Medical School . What Does a Microsystem’s Developmental Journey Look Like? What Does the 5 P’s Framework Look Like? What Resources Are Available to Guide the 5 P’s Assessment? What Tools Can Assist Your PDSA Cycle ↔ SDSA Implementation? What Are Some Tips for Using the PDSA ↔ SDSA Method? 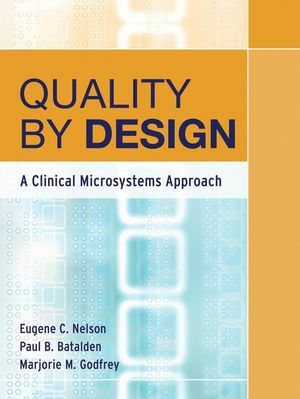 Author reputation: Paul Batalden is the best known and most accomplished scholar in the area of clinical quality improvement, personally recommended by Don Berwick (Institute for Healthcare Improvement/Harvard Medical School.). Batalden’s name will be a unique hook for this title. Timing: The proposal is being planned in tandem with a major grant from the American Hospital Association for production of a standard in-service curriculum in clinical quality improvement. Platform: The American Hospital Association, the Institute for Healthcare Improvement (Berwick’s group), and Dartmouth Medical School are all planning professional and academic training programs built on the Dartmouth/”Microsystems” approach. Mission to teach: This book is being adapted from training materials developed over the past eight years as part of coursework in Dartmouth’s master’s program in health improvement and attendees of Dartmouth’s summer “boot camp” in quality improvement. Authors are interested in developing instructors’ materials to support use of the book in professional and classroom use.